There is no one Bible online, which would be better than everyone else about everything. There are several services here, each has its own advantages. study.calvinseminary.edu - Scripture Study App - There are 3 English translations (KJV, NET, WEB), Spanish RV and 2 Ancient Greek and Hebrew WLC. There is no Russian. Convenience - we direct on the word and the word is highlighted in Hebrew, that is, in the original. NET has footnotes. Adjustable font size, breakdown by verse or paragraph. You can even remove the numbers of poems and read like a book. ebible.org/study - inScript Bible Browser - A large number of Bible translations, Parallel selection of text, Strong's dictionary - click on the word and watch the translation. Simple, convenient, functional, worth a try. 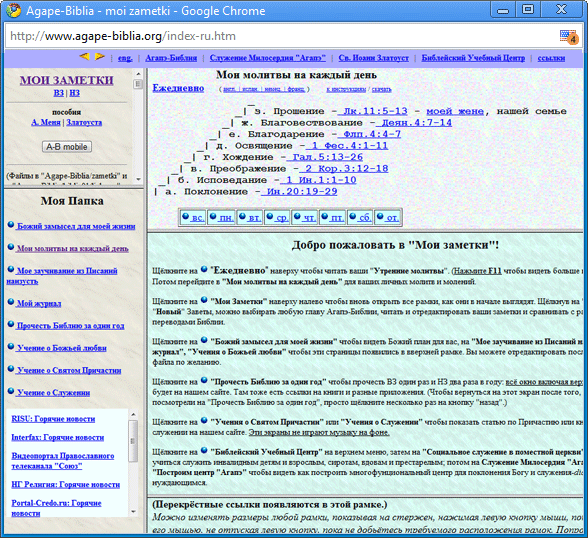 A site with a new English Bible translation of the NET Bible and a parallel window with interpretations of open Bible sites. The whole Bible can be read with a scroll, nothing else is needed to open. Bible online, many translations, including 2 in Russian: synodal and new translation from the International Bible Society. The interface of the site is Russian. The Bible is clear, simple - the text is on the whole screen. Thus, space is used more efficiently. Registration allows you to select the main translation, for example, the Synodal. Include other translations that you wish to avoid 30 translations, and of which you need 3. Text Design - each verse from a new line or paragraph. The site of the author of the most popular computer Bible, the program Bible Quote. Simple navigation, parallel translations in NIV, KJV, NKJV, NASB. You can read or listen. A veteran of the Christian Internet. It's not just the Bible online, but the Bible with explanations, it's structured thematically. The Bible and the commentaries. The translation of the Bible into Russian was carried out by the St. Petersburg, Moscow, Kazan and Kiev theological academies from 1856 to 1876. The translation was based on the Russian text of the New Testament, the Psalter and the Pentateuch, which appeared As a result of the work of the Russian Bible Society in 1816-1826. The final version was carried out by the Holy Synod and personally Metropolitan of Moscow Philaret (Drozdov). The full text of the translation was published in 1876. The Synodal translation is the main text of the Bible for all Christians of Russia. You can read or listen. Simple, easy and convenient search, you can use the advanced search. Translations are constantly supplemented, there were Portuguese, Chinese, Turkish, Greek, French, Romanian, Spanish, Italian. basic online, a version with bare text, very easy, audio Bible, version, for mobile. There are 4 languages, but only Russian is active and therefore only one version of the Bible. Interesting visual design, the ability to add notes, read other people's notes on a particular place in the Bible. A quality website for working with the Bible, the possibility of 2 parallel windows, creating notes, tags, share a place. The main drawback is a very small base of versions of the Bible - only basic translations and only in English.